Customers can now buy products online from the Apple Store using PayPal. Previously available as a payment option for purchases made through the App Store and iTunes, PayPal could only be used for buying digital goods, but this seems to have changed now. PayPal is being accepted for making product purchases at Apple.com, but is limited to consumers based in the U.S. and United Kingdom for now, and whether this will expand to more shores or not is yet to be seen. More so, the PayPal option has also fallen short of reaching the Apple Store app, and if the payment option will be making it to the app anytime soon, remains unclear. 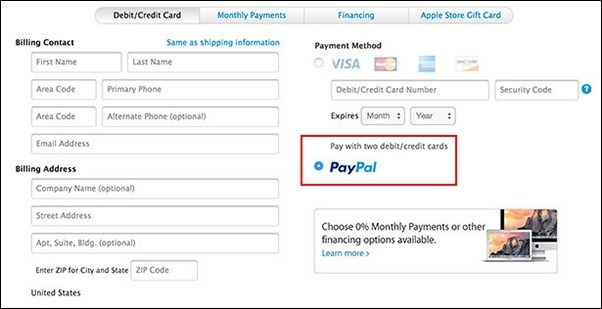 Users checking out with a purchase made at Apple.com will now see PayPal as an option sitting below the usual Debit / Credit Card facility that many are accustomed to. Excitingly, PayPal is also offering its own line of credit as well – PayPal Credit. For those unaware of this service, PayPal Credit is extending a monthly payment option expanding up to 18 months for consumers looking to purchase items from Apple.com costing $250 and over. As for the interest on this credit line, there is none, so this should please a lot of consumers. All of this has transpired amidst some mildly troubled relations between the two companies. Reportedly, Apple was in talks with PayPal to reach a deal that would have seen the two partner up for the service, but PayPal reached a deal with Samsung instead, which lead to users being able to pay through PayPal via the fingerprint sensor on the Galaxy S5. Clearly, Apple did not take the development too well, and the deal between Cupertino and the international digital wallet company pretty much fell through after that. 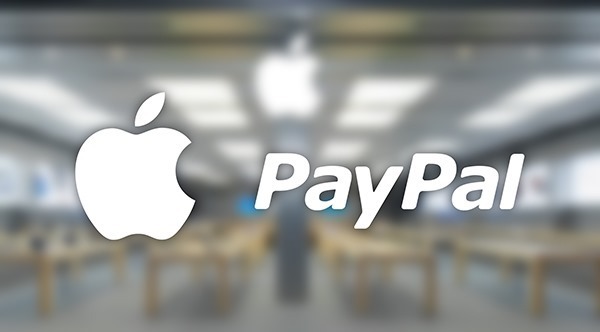 While some consumers may be more adaptive to using PayPal for making payments across various services, the introduction of Apple Pay as the primary mode of electronic payments from the iPhone 6, 6 Plus, iPad Air 2, and iPad mini 3 could push PayPal to redundancy, in at least the Apple circle. Do you think iOS users with Touch ID on their devices would ditch PayPal in favor of Apple Pay? Do share your thoughts on the matter with us.